Soooo....raise your hand if you've heard about a documentary coming out titled "American Blogger". Quite a bit of controversy has erupted over it. I must admit, I have felt my share of irritation over it. Today, Elaine of The miss-Elaine-ous Life shares her View of the hoopla. Last week I went through a range of emotions after seeing the “American Blogger” trailer that many people were talking about. As I watched it for the first time I thought “how pretty” and also “how very singular”. 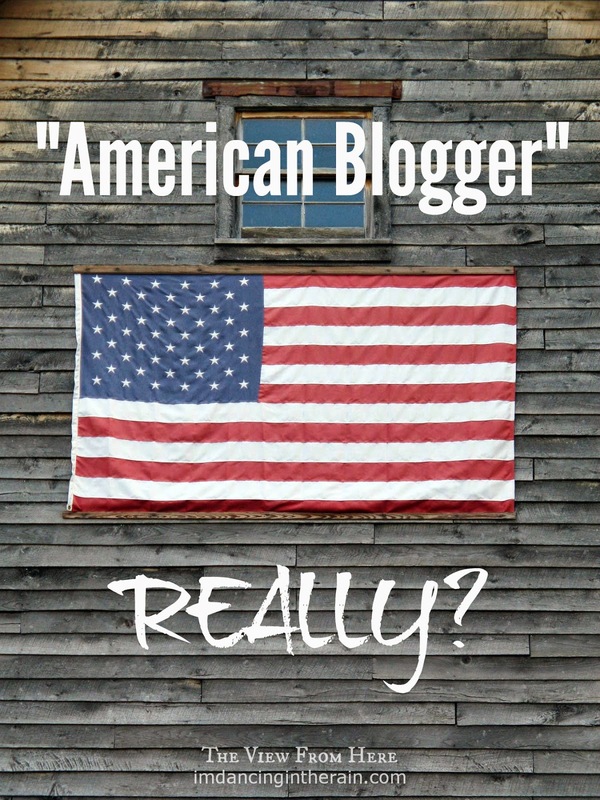 I immediately wondered why the film was titled “American Blogger” when it simply did not seem to represent the true scope of those of us that blog in this country. I saw very little diversity. There was even talk that the trailer might be a spoof or something to that effect, and at first I even questioned it myself. But surely not, no way would someone be “making fun”, and so beautifully, of what I and so many others in this country consider not only a pastime, but also a way of life in some regard. Once it was confirmed that it was most certainly not meant to be a parody, and once I watched the trailer again I felt more of a connection to what the filmmaker was trying to show his audience. However, I still could not shake the feeling of exclusivity and the “Really?” in my head. I have decided what bothers me the most about it is the use of the word “American” in the title. Obviously the filmmaker (husband of blogger Casey Wiegand) traversed the country to give us a look into theses women’s lives and they are all American, but I think the use of that word is wrong when presented with such a selective group of women. Then, I read a post by Casey Wiegand herself that was very well written and from the heart. And I related to her because I have friends like Casey too. I have friends that I have met online that are in my heart every day. Their stories have become a part of my life. I pray for them. I encourage them. I hug the stuff out of them when I actually do get to meet them and maybe I am lucky enough to see them again. I wish, wish, WISH there were some that I could meet in person that I have not (yet). So I get that connection, I truly do. I don’t mean to demean any of these ladies’ stories. I don’t think anyone does. I am willing to bet that most, if not all of them are inspiring and wonderful to know about. I do however, feel like the trailer -- the “teaser” that was put out for the online world to see -- was just a bit over the top and made the rest of us feel “less than”. Is it Casey or her husband’s fault that I (and many others) felt that way? Maybe a little but not enough to make me stop being an “American Blogger” at my best and in the way I know how. I will probably see the film in whatever format it eventually comes out (iTunes, I think…?) because I do support and know and connect with bloggers from many different walks of life. And I do believe that Mr. Weigand and his wife had the best of intentions when making the film, but they missed the mark a bit when introducing it to the big ole Internets. I am willing to give it a chance, just like Casey asks us to in her post. And I hope Casey and her husband are willing to do the same with others, outside of their circle, in the future. I am glad Elaine wanted to write about this. I was hesitant to myself, because I wasn't sure I had anything more to add to the conversation than what had already been put out there. I agree with everything Elaine said. I would like to reiterate the word "exclusivity" because that is indeed what is at the heart of everyone's problem with this film. If you're going to title a film about American bloggers "American Blogger", you should have included a much broader cross-section of people. There should be men included, as well as racial diversity, at least, not to mention a representation of the various blogging niches. Perhaps the title should be: "A Few American Bloggers".